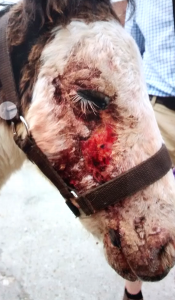 The RSPCA is appealing for information after a 3-month-old foal was found with burns to 90 per cent of his face and body, and other injuries thought to have been caused by a hit and run vehicle incident. The national charity is also appealing for information of the whereabouts of the foal’s mother. The 3-month-old colt now known as Murphy was rescued by the RSPCA after a call from a member of the public reporting an inured foal found ‘staggering in the road’ on Friday 10th July with no mother in sight. The callers confined the foal to a nearby horsebox and kept him safe until RSPCA Inspector Sam Garvey arrived. Inspector Garvey said: “Poor Murphy was in a sorry state when I arrived to collect him. Not only was he suffering with suspected hit and run injuries, he also had very nasty burns to his face and body. We do not know exactly what caused these burns – but we think it was some external cause. It is not yet known who owns Murphy, as well as who was driving the vehicle that hit him, and who inflicted the burns. Murphy was taken Catley Cross Veterinary Clinic in Halstead, Essex, where he received treatment for his burns and injuries. He will be moved to RSPCA Millbrook, a specialist equine centre next week where he will continue to be cared for. 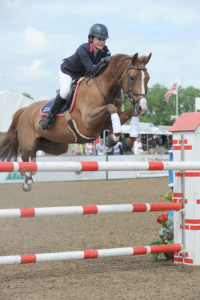 British Showjumping is pleased to announce that Jodie Hall McAteer, aged 15 from Borehamwood, Hertfordshire has been selected for the squad representing Great Britain at the forthcoming FEI Pony European Jumping Championships, which will be held during the 5th – 9th August in Malmo, Sweden. Competition starts on Thursday 6th August with Team medals being decided on Friday 7th August and Individual medals on Sunday 9th August. The British Team will compete under the guidance of Youth Team Manager, Clare Whitaker and Pony Chef d’Equipe Matt Lanni. The British Young Rider, Junior, Pony and Children on Horses European Championship teams are supported by the UK Sport National Lottery funded World Class Programme. The teams are also kindly supported by official Equestrian Team GBR suppliers; Dodson and Horrell, Equi-Trek, Land Rover, NAF, NuuMed, Point Two Equine, Tagg Equestrian and Toggi. The teams are further supported by Animo UK, Champion Hats and Next. Blue Chip ran a competition to find two sponsored dressage riders to join their elite team, a shortlist has been selected and the voting is now open! The two lucky riders (one from the restricted section and one from the open section) who get the most votes will win 1 year’s sponsorship from Blue Chip. Voting closes on the 31st July 2015, and we will be in touch with the lucky winners shortly afterwards, so look at the website and get voting for your favourite rider! This year sees a totally refreshed schedule for this year’s Wayland Show held on August 2nd 2015, near Watton, Norfolk. While the Wayland Show will maintain its reputation in the calendar as an event for keen and competitive amateurs, its ever increasing entries has meant introducing some new and exciting classes. Qualifiers are introduced for the new Ridden Arabian Showing Series, the QUEST series for Gypsy Cobs, and first round qualifiers for Senior Showing and Dressage for our older competitors. As well as its traditional showing classes, the show will also hold for the first time new ridden and in-hand classes for rescued horses, and with two of the largest rehoming charities based locally, there are more and more prospective competitors. New, and unique at least in the East, is the EQ Inter-team Relay. This has been specially designed for teams of three to go head to head against the clock on a mirror image course. A real test of horsemanship, the course will include jumping a ditch, crossing a bridge, a walk and halt section as well as a hunting gate that will have to be opened and closed. 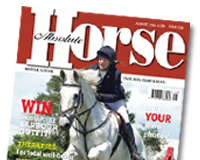 With £500 of prize money on offer, this unique event will attract teams, it is hoped, from every equestrian discipline. And to make sure that the excitement does not end there, the British Scurry and Trials Driving are competing for the Wayland Scurry Trials Champion for 2015. Preliminary qualifying rounds will held all day, with the final in the main ring. Don’t forget that your entries will go towards raising money for local causes, and so not only will riders have a really great day but will also be helping someone in need. Schedules are now available from the Secretary or at www.waylandshow.com. Wednesday 1st July, the hottest day so far this year, saw Suffolk based Tim Davies and Barrett Watson’s 13 year-old bay gelding Valentijn O climb three places into 2nd place on the International Stairway League by winning the fifth leg of the series at Royal Norfolk Show. It certainly wasn’t an easy win, as the testing course had only seen three of the field manage to jump clear in the first round with faults being notched up across the course by the remaining eighty percent. With five riders in total coming forward for the second round, in line with the format of this competition, the riders that jumped clear were joined by Anna Edwards and Blazer B whom had secured their place by being the fastest combination with one fault along with Phillip Miller and Caritiar Z who were the fastest on four faults. Jumping in reverse order based on faults and time in the first round, Tim Davies had the luxury of being drawn last to go. As he entered the area, the only rider that had managed to produce yet another clear and therefore a zero penalty tally was Tim Stockdale with his new ride Bling Bling, a 9 year-old bay gelding owned by Ann Basey-Fisher. Deciding to take the gamble and press for a fast clear, Valentijn O was asked to put his foot down. 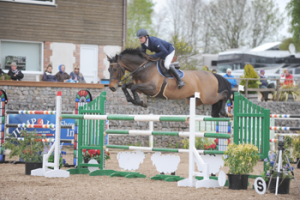 Leaving all fences standing and untouched he managed to break the finish line almost four seconds faster to secure the class title and lion share of the £7,500 on offer. Relegating Tim Stockdale and Bling Bling to second place, it was Anna Edwards from Clevedon with her own 9 year-old bay gelding Blazer B who jumping clear in the jump off finished on just the one time fault accrued in the first round that finished in third. After jumping clear in the first round Douglas Duffin from Dollar, Clackmannanshire, partnering his own 10 year-old bay gelding Quidam BZ finished in fourth after picking up four faults halfway through the jump off course. Phillip Miller from Harpenden, Hertfordshire finished in fifth place after he and Caritiar Z a 15 year-old grey gelding owned by Nigel Eccles, Di and Pennie Cornish added another four faults to their tally meaning that they finished on eight faults overall. The series now moves to the Great Yorkshire Show on the 15th July.